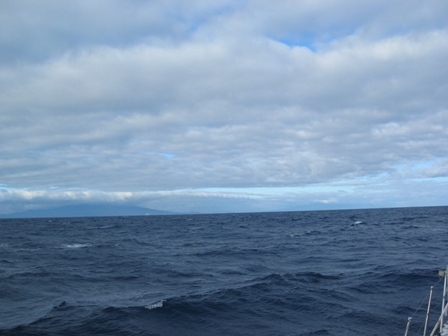 This was the late afternoon view of Faial on the left and a glimpse of the mountain on Pico barely discernable in the clouds on the right. GPS as made accurate landfalls a cinch! We did bring a sextant to see how close we can get to the GPS position, but we'll have to study up a little first. The island of Faial has a surface area of 173.4 sq km (67 sq miles) is 21 km (11.3 miles) long and 14 km (7.5 miles wide). 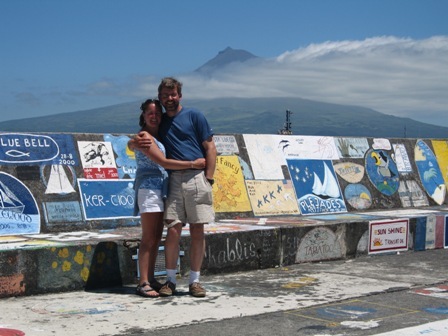 It is separated from Pico island by a stretch of sea that is 8.3 km ( 4.5 miles) at the widest. 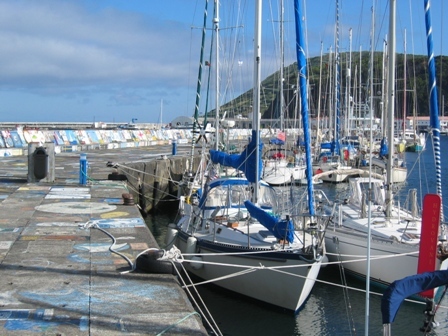 Faial was settled in the first half of the XV century by Flemish farmers and prospered with the development of Horta harbor, which was used as a stop over for ships and more recently, "flying boats" crossing the Atlantic. Many of the approximately 16,000 or so inhabitants still live by farming and through fishing. It is amazing (and sad) to think that whaling did not cease here until the early 80's. 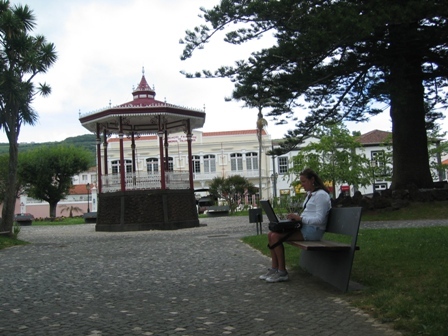 Today the atmosphere around Faial is an international one, with a mild climate where life here remains refreshingly civil and unhurried. Every day from 12-2 pm all of the stores close and the town becomes very quiet. You can walk around the neighborhoods and smell amazing aromas coming from their kitchens. We can't believe that we will be leaving here to head for the UK and Holland where it is rainy, colder and a much faster pace. So while we are here will "act native", relax, sleep in late and stay up till all hours of the night and "party" as Marco likes to say. Rising high over the clouds is the peak of Pico Alto. It is still an active volcano and dominates the island of Pico. At 2,350 m (7,700 ft) above sea level, Pico Alto is the highest peak in all of Portugal. 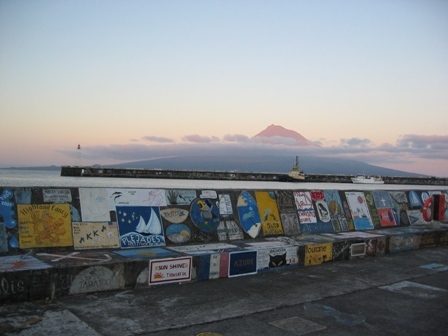 Here is a picture of a sunset over Pico with the traditional paintings of the yachts that have visited in the island of Faial in the past. Some of the paintings are remarkably well done. Dalliance resting quietly along the seawall in Horta, with our French neighbor alongside. Happy to be here in our second foreign port of the trip. Free wireless web access in town has been great to retrieve our Email and update the website. This has become a daily routine here in Horta. 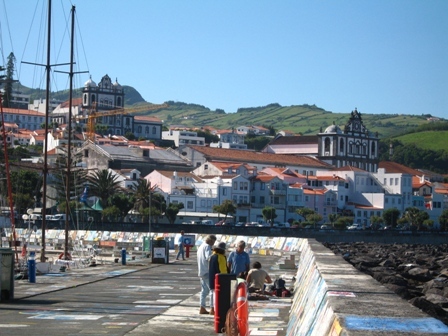 Downtown view of Horta from the marina. 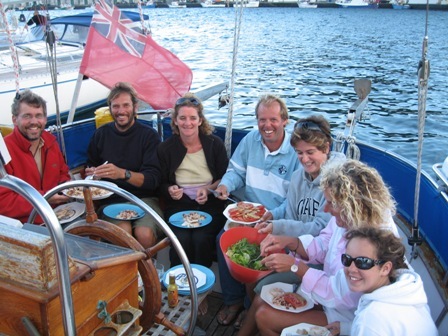 Here we are having dinner aboard "Wild Alliance" a Formosa 51'. It is owned by John and Viv, some new friends from the UK. We had a fantastic evening, swapping stories, laughs and great food. Marco and I had a really fun dinner at Quebra Mar Restaurant. You ordered what you would like, we ordered the mix (squid, swordfish, red snapper, pork, steak and chicken). 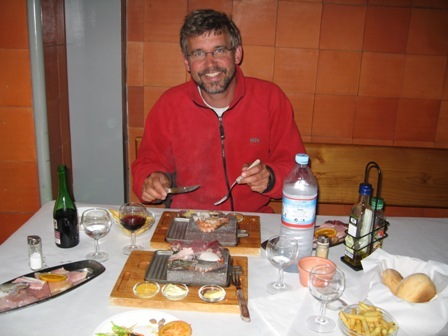 They then brought the food out raw and you cooked your own dinner on these really hot stones. It was very unique but we figured it would never go in the US with the potential for salmonella. Yesterday, June 24th, Marco and I went for a really beautiful walk and found this great spot for snorkeling at Baia de Porto Rim. Here lava structures jut out of the water for quite a distance and you are able to snorkel in 10-20 ft. of water around the structures. We saw many beautiful fish (purple reef fish which are part of the damsel family, grunts, goat fish, parrot fish, wrasses, and this weird looking fish that we don't know what it was but looked part eel, part fish with fins that looked like wings. 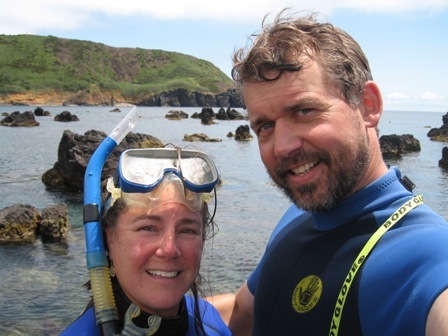 We wore our shorty wet suits because the water was a little chilly but the visibility was amazing. 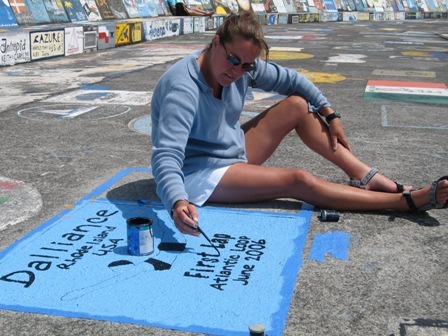 According to tradition, it is bad luck to leave Horta without leaving your ship's mark on the sea wall. 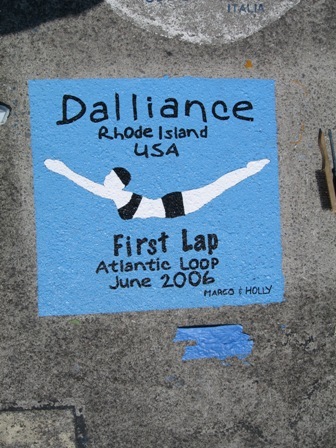 Definitely not tempting fate, we gladly left Dalliance's First Lap Motif alongside her berth along the seawall. As chance would have it, two Dutch journalists from the ANWB's Horizon Magazine took pictures of our art for the March 2007 issue for travel in the Azores. We're planning to leave for the U.K. over the next few days, as the Northerly winds are expected to become more westerly.